Tampa Mortgage rates and Clearwater home affordability have improved lately, thanks to an unlikely ally — Mother Nature. Conforming and FHA mortgage rates in Florida touched a 3-week low earlier this week. 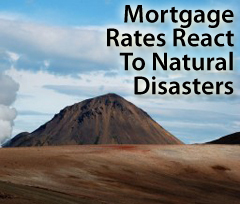 Volcanic eruptions and like natural disasters remind us: Tampa mortgage rates change for all sorts of reasons. Some we can predict, most we cannot. There’s literally thousands of influences on the U.S. mortgage market. If you’ve been shopping for Clearwater FL homes for sale or Clearwater beach condos or floating a mortgage rate, luck’s been on your side. Mortgage rates have fallen post-Eyjafjallajökull. However, as ash clouds dissipate and business resumes worldwide, investors will regain their collective appetite for risk and safe haven buying will reach its natural end. When that happens, Tampa mortgage rates will rise. Therefore, if you are in the process of buying a Clearwater home or beach condo use the seismic uncertainty to your advantage. Consider locking your Tampa mortgage rate sooner rather than later — while rates are still low. Got any questions, just give us, your local Clearwater FL Realtors a call or talk to your loan officer about locking your rate on the Clearwater FL homes you want to buy. We’re passionate about being your Clearwater Fl real estate advocate. We’re committed to delivering Results daily based on Integrity, Knowledge & Experience – helping you find the perfect Clearwater FL homes for sale. I think the oil spill in the Gulf of Mexico is going to impact real estate activity in the Tampa Bay area over the upcoming months. While Europe is dealing with the volcano in Iceland we are now dealing with our own disaster. If BP Oil doesn’t get the oil spill under control scientists are saying the gulf currents could bring the massive oil spill down the entire west coast of Florida, through the Keys, and then up the east coast of Florida. Several times recently I have heard buyers from out of state comment that the oil spill is making them nervous about investing in Florida real estate. Thanks for stopping by. I hear you but with Tourism being our number one industry I don’t see them working and doing whatever it takes to get it cleaned up – it’s definitey a mess and an eco nightmare – I know the Seabird Sanctuary and the Clearwater marine aquarium and more are bracing and training volunteers to help in the mess if it does get here and impacts our beaches. I’m mostly concerned with the sea birds and marine life. The Exxon Valdez sure did some damage and they’re saying this will be a much worse spill than that one was. I’ve been to the Clearwater Aquarium several times but am not familiar with the Seabird Sanctuary. Oil and sea birds don’t go together. I am really worried about this spill and what the next few months will be like. Imagine the oil washing ashore during a hurricane. I spent really nice time reading yours articles. I’m happy that I went right here. Good. It’s everything here exactly what I was looking for.